Needless to say, we are always excited to see if such breakthroughs in video quality and low bandwidth consumption can be delivered. Overall, the DVTel camera is ok but has a few surprising issues, in how it controls the shutter and fixes the compression level. Additionally, the quality is neither better nor is the bandwidth consumption lower after adjusting for compression tricks. Low light performance was relatively poor compared to top cameras tested against. While the camera is marketed as WDR, DVTel acknowledges and our tests showed that it was not on the same level as 'true' WDR from Axis, Sony, etc. Exposure Mode Complication: This camera only allows controlling iris or shutter speed but not both at the same time. This can create video quality problems and is not common with other high end professional cameras (that dynamically control both simultaneously). Compression Settings: When using VBR, the quality/compression level is fixed at a fairly high loss level. This drives bandwidth savings but creates noticeable artificating. Price: The MSRP is $975, without a lens. After dealer discount, that puts it roughly at the same level as other high end HD cameras. If you are using an end to end DVTel offering, the camera may make sense. However, for everyone else, there are equally good or better cameras at the same or lower pricing from more mainstream providers. Most importantly, the low bandwidth and high quality claims should simply not be considered as we see no evidence to support them. For professional HD cameras in 2012, the performance is average. 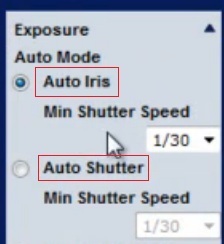 Be careful about choosing between auto iris and auto shutter modes, a choice that is unnecessary on most professional auto-iris cameras. The default auto iris mode allows the camera to dynamically adjust the iris opening but fixes the shutter speed at 1/30s. Any fast moving objects (like cars) will likely blur. The optional auto shutter mode allows the camera to dynamically control the shutter speed but fixes the iris to fully open, essentially making it a manual iris camera. This is a bad default and an unnecessary restriction for cameras in this tier. DVTel recommends to use the camera in CBR mode. In testing, we used both VBR and CBR. VBR was used to see how far bandwidth consumption would drop dynamically. CBR was used to confirm and compare. Important: If you use this camera in production, we recommend against using VBR because, unlike nearly every other professional camera, there is no user adjustable quality/compression control. Worse, the locked quality level is low and leads to artificating that is especially noticeable in high motion scenes. 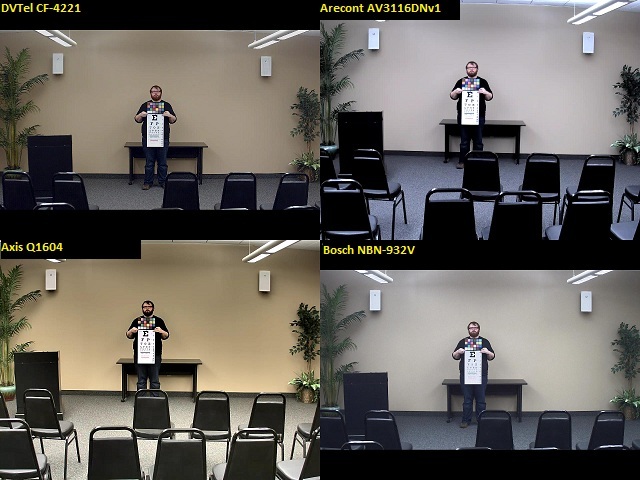 In an indoor, evenly lit (~295 lux), 22 foot wide FoV (about 28' to target), DVTel consumed the least bandwidth by far (using VBR) but showed moderate levels of artifacting around the subject's body. This artifacting becomes apparent when zoomed in on the subject. Overall, though the images were roughly comparable, with the 720p Axis, not surprisingly capturing less details than the 1080p/3MP cameras. Be careful with such a slow shutter. 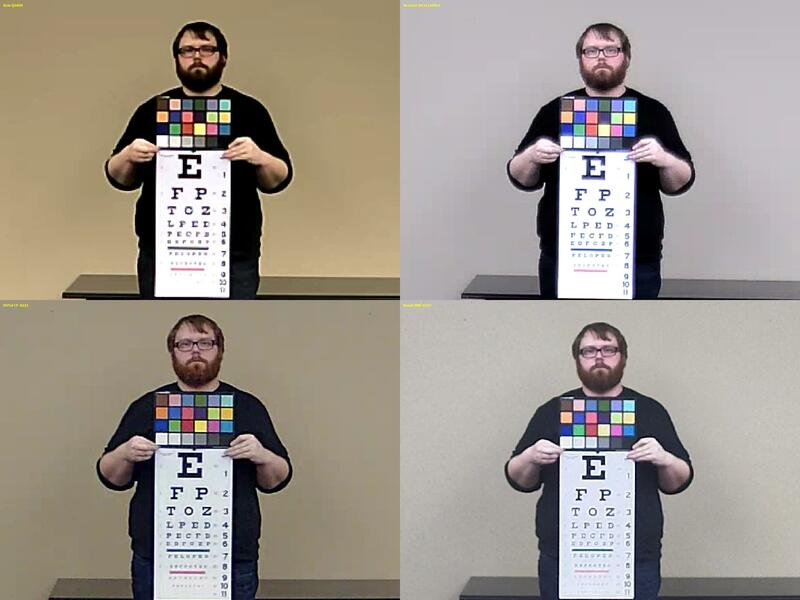 For purposes of our test, we normalized all cameras to a minimum 1/30s shutter. 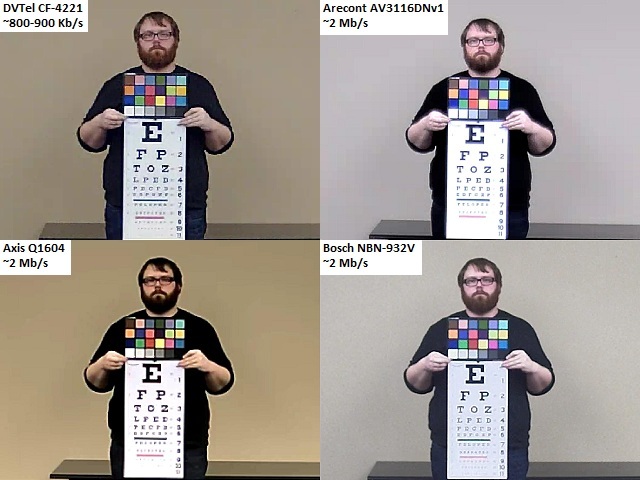 In low light (~.1 lux), the CF-4221 essentially becomes black, while the other cameras in this test produced at least some usable image (with normalized 1/30s exposures). Despite the lack of usable image, bandwidth also increases by 2-3x, from 800-900 kbps to around 3.5 mbps in variable bitrate mode. We did two test runs for the intersection. In the first run, we set DVTel at VBR and the bitrate it settled on was ~4Mb/s. 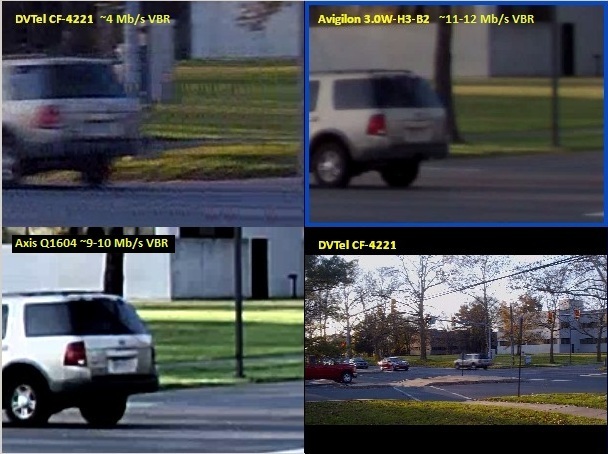 In addition to the image artifiacting due to the high locked VBR compression level, DVTel displayed more blur because it was in its default auto iris control which fixes the shutter to 1/30s. 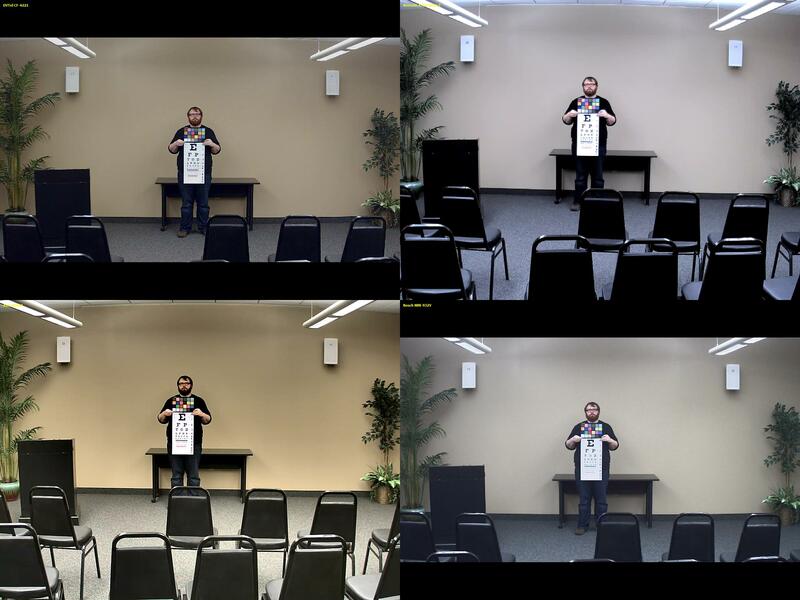 Users may download a 10-second video clip (66 MB file) to review video from all six cameras in this scene. We also tried DVTel at CBR of 4Mb/s but not surprisingly image quality issues / differences remained the same. We then doubled DVTel's CBR rate to 8Mb/s. Enabling constant bitrate of 8 Mbps in the CF-4221 results in less noise, with the grass seen in the background becoming more clear. 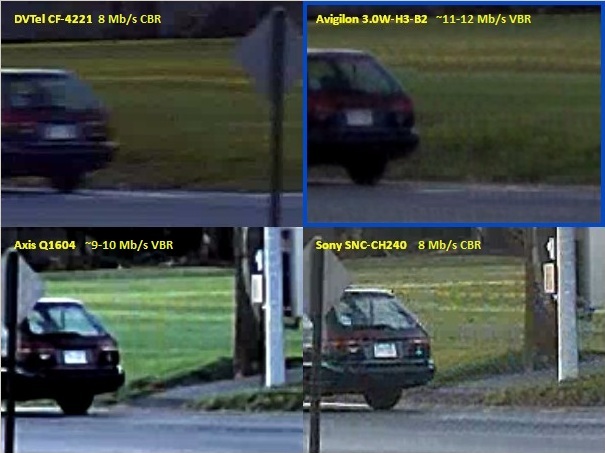 In this comparison, we also increased the Sony SNC-CH240's bitrate to 8 Mbps. It still displays noise, though there is less blur on the moving car than in the DVTel image. Bottom line, what we found was aggressively high default compression levels with DVTel, not any breakthrough improvement in compression or image quality.